Non-asthmatic variants of Churg-Strauss syn­drome (CSS) are being increasingly repor­ted. , Renal involvement is however limited to a few case reports. , It is important to identify CSS because of its favorable response to therapy and good long-term prognosis. We present a case of pauci-immune crescentic glomerulonephritis in non-asthmatic CSS and review of the literature on renal involvement in non-asthmatic variants of CSS. A 58-year-old male presented with a 3-week history of low-grade fever, weight loss and progressive distal to proximal weakness, ini­tially involving the upper limbs followed by involvement of the lower limbs. He also reported pins and needles pain in both lower limbs. He denied any history of high blood pressure, asthma, skin lesions, hematuria or oliguria. He denied using any prescriptions, over-the-counter drugs or herbal medications. Physical examination revealed pallor, pulse rate 92/min, blood pressure 150/100 mm Hg, temperature 36.9°C and respiratory rate 15/min. Cardiac examination was unremarkable. Lungs were clear to auscultation. The abdomen was soft, non-tender and had no palpable hepatosplenomegaly. Neurological examination re­vealed quadriparesis with signs of sensory and motor polyneuropathy. Electroneurography showed sensorimotor polyneuropathy with signs of axonal damage in the right sural and left common peroneal nerves. His investi­gations included hemoglobin 9.7 gm/dL, total leukocyte count 9.4 × 1000/μL (4-10 × 1000/ μL) with eosinophils 42%, neutrophils 47%, lymphocytes 10% and monocytes 1%, platelet count 462 cells/mm 3 (150-400 × 1000 cells/ mm 3 ), reticulocyte count 1.2%, serum creati­nine 3.8 mg/dL (0.5-1.6 mg/dL), uric acid 7 mg/dL (3.9-8.9 mg/dL), calcium 9.4 mg/dL (9-11 mg/dL), inorganic phosphorus 3.8 mg/dL (2.5-4.5 mg/dL), total bilirubin 0.6 mg/dL (0.1-1.3 mg/dL), direct bilirubin 0.4 mg/dL (0-0.5 mg/dL), total protein 5.9 g/dL (6-8.4 g/dL), albumin 3.8 g/dL (3.5-5.5 g/dL), serum glutamic oxaloacetic transaminase (SGOT) was 16 IU/L (5-40 IU/L), serum glutamic pyru­vate transaminase (SGPT) 18 IU/L (5-40 IU/L), alkaline phosphatase 24 U/L (35-150 U/L), lactase dehydrogenase (LDH) 120 IU/L (85-450 IU/L) and creatine kinase-MM 37 μ/L (5-172 μ/L). The C-reactive protein of 7.5 mg/dL (0-0.6 mg/dL) and erythrocyte sedimentation rate of 92 mm/h were elevated. Anti-dsDNA antibody [11.25 IU/mL (normal 0-30 IU/mL)], anti-glomerular basement membrane (anti-GBM) antibody <3 au/mL (0-15 au/mL) and rheumatoid factor titers [7.55 iu/mL, (normal 0-20 IU/mL)] were all within normal limits. Complement levels C3 79.9 mg/dL (normal 60-120 mg/dL) and C4 28.1 mg/ dL (normal 15-30 mg/dL) were also in the normal range. HBsAg and anti-HCV antibody enzyme-linked immunosorbent assays (ELISA) were nega­tive. Computed tomography (CT) of the chest and X-ray of the paranasal sinuses were nor­mal. Urine and blood cultures showed no growth. Pulmonary function tests and echo­cardiography did not reveal any abnormality. Ultrasound revealed normal-sized kidneys with normal corticomedullary differentiation. Doppler ultrasound of the renal vessels was normal. Urine analysis showed hematuria with 3+ proteinuria. The 24-h proteinuria was 1.8 g in 1900 iriL of urine. There were 0-1 white blood cells per high-power field, 15-20 red blood cells per high-power field and no evidence of casts on microscopic examination of the urine sediment. Perinuclear antineutrophilic cyto­plasmic antibody (p-ANCA) titer was raised (247 RU/ML, normal <10 RU/ML) and cyto­plasmic antineutrophilic cytoplasmic antibody (c-ANCA) was normal (4.5 RU/ML, normal <10 RU/ML). Anti-myeloperoxidase ELISA was positive and anti-proteinase 3 ELISA was negative. The diagnosis of p-ANCA-associated vascu­litis with rapidly progressive glomeruloneph­ritis was made and ultrasound-guided percu­taneous renal biopsy was performed on the fifth day of hospital stay. Light microscopy showed 20 glomeruli, two of which were scle­rosed while 12 showed cellular crescents and six showed segmental necrosis and eosinophil infiltration [Figure 1]A and B. The tubules showed focal atropy and the interstitium showed lymphocytic inflammatory infiltrate with several eosinophils. Immunofluorescent micrography revealed absence of specific immunoglobulin or complement (C3, Clq) de­posits, consistent with a possible diagnosis of CSS. From Day 5, the patient was treated with intravenous pulse methylprednisolone (500 mg/day, three doses), followed by oral predni­solone 1 mg/kg/day and intravenous cyclo­phosphamide (750 mg/infusion, first dose). Meanwhile, the patient had progressive dete­rioration of renal function necessitating dialytic therapy. The patient required alternate day hemodialysis of 4 h duration for mainte­nance of volume status. Over the next seven days, there was no significant improvement in the neurological or renal status. On Day 12, the patient developed severe lower quadrant abdominal pain and tenderness. As abdomen X-rays showed evidence of perforation, emer­gency laparotomy was performed. Intraope­rative findings included two perforations in the ileum at 3 and 3.5 feet distance from the ileocaecal junction (ICJ) and an ulcer with impen­ding perforation at 4 feet from the ICJ. Seg­mental ileal resection and endileostomy with mucosal flap were performed. Histopathology of the resected specimen showed evidence transmural inflammation of sub-mucosal and serosal vessels with perivascular infiltrate comprising of lymphomononuclear cells and eosinophils [Figure 1]C-E. Figure 1: Photomicrograph showing (A) glomerulus with a circumferential fibro-cellular crescent obliterating the capillary tuft and dense interstitial inflammatory cell infiltrate with prominence of eosinophils (arrows) (HE); (B) extravascular eosinophils in renal biopsy (HE); (C and D) ileal segment showing a submucosal small-sized blood vessel with transmural and perivascular mixed inflammatory cell infiltrate along with fibrinoid necrosis of the wall (arrow) (HE); (E) elastic stain revealed disruption of the internal and external elastic lamina (arrow) (Orcein). The patient was continued on maintenance hemodialysis, intravenous methylprednisolone and appropriate supportive care. On Day 13, in view of persistent disease progression, a se­cond dose of intravenous cyclophosphamide was administered (750 mg as infusion) and maintenance dose intravenous steroid was con­tinued. By Day 20, his eosinophil count dec­reased to 10% (total leukocyte count 11.4 × 1000/μL, 4-10 × 1000/μL), erythrocyte sedi­mentation rate (ESR) decreased to 23 mm/h and p-ANCA titer was 220 RU/ML. There was significant improvement in hand grip and paresthesias resolved completely. In view of persistent renal failure, immunosuppression was modified to oral cyclophophamide (50 mg/day) with oral prednisolone 10 mg/day from Day 20. On Day 33, the patient was dis­charged with advice of maintenance hemodia­lysis, oral cyclophosphamide 50 mg/day, oral prednisolone 10 mg/day, antihypertensives (two drugs) and ileostomy care. Patient's renal function gradually improved and at the end of the 8 th week, he was dialysis independent. After 12 weeks, the patient's eosinophil count was 7%, renal function returned to normal with a subnephrotic proteinuria of 800 mg/day and p-ANCA titer was 145 RU/ML. Cyclophos­phamide was tapered and oral prednisolone 10 mg/day was continued. He underwent ileos­tomy closure and corrective surgery after 24 weeks. At 12 months after the onset of illness, he is relapse free and normotensive, has a serum creatinine of 1.1 mg/dL, 24-h protei­nuria 120 mg and normal p-ANCA titers with a regimen of 10 mg/day oral prednisolone. With the presence of sensorimotor polyneu­ropathy, rapidly progressive glomeruloneph­ritis (RPGN) and p-ANCA positivity, a diag­nosis of ANCA-associated vasculitis was made. The differential diagnosis of microscopic poly­arteritis, Wegeners granulomatosis (WG) and CSS were considered. Absence of pulmonary involvement and c-ANCA negativity excludes WG. As there was no pulmonary or paranasal sinus involvement, our patient does not satisfy the American College of Rheumatology (ACR) criteria or Lanham criteria for diagnosis of CSS. Microscopic polyarteritis can occasio­nally show eosinophilia, but presence of extra-vasular eosinophils in renal interstitium and ileal specimen with marked peripheral blood eosinophilia favors CSS. Although vasculitis may precede asthma in CSS, our patient has been observed for 12 months since the onset of vasculitis and he did not develop any evidence of pulmonary involvement thus favoring a diagnosis of non-asthmatic CSS. Limited forms of CSS are often recognized by eosinophilia and histological findings of skin, lung, intestinal or renal biopsies. Asthma is seen in 98% of CSS patients (classical CSS). Although reports of non-asthmatic CSS are not uncommon, only eight of these patients had renal involvement [Table 1]. 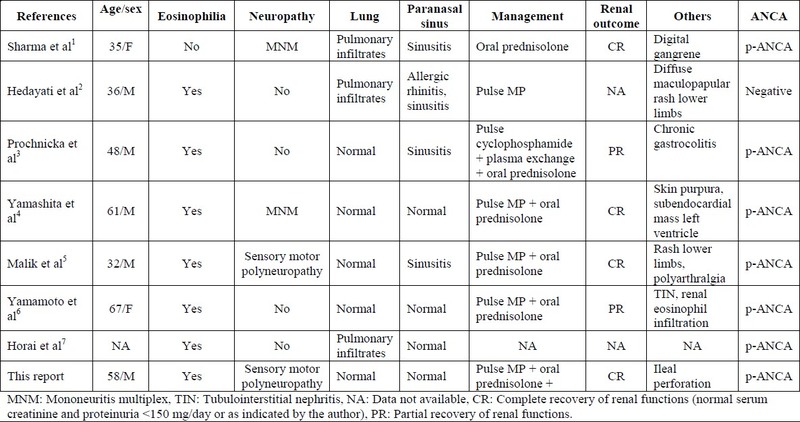 ,,,,,, Interestingly, pauci-immune necrotizing crescentic glome­rulonephritis was the only renal manifestation [Table 1]. Table 1: Summary of patients with non-asthmatic Churg–Strauss syndrome and crescentic glomerulonephritis. Seven of the eight patients had p-ANCA positivity. This indicates a greater prevalence of p-ANCA Myeloperoxidase (MPO) positi­vity in CSS patients with signs of glomerular involvement. In a study of 116 patients with CSS, Sinico et al  found ANCA positivity in 75% of CSS patients with nephropathy as compared with 25.7% in patients without nephropathy. Another remarkable finding in non-asthmatic CSS is the rapid response to therapy. Steroids with or without cyclophosphamide have ob­tained renal recovery (complete or partial) in all seven patients. Our patient is interesting due to the rapidly severe multisystem involve­ment and delayed yet remarkable response to immunosuppressive therapy. Improvement in neurological status and laboratory parameters (eosinophils and ESR) were seen by the second week of therapy and renal functions recovered over a period of 12 weeks. Sinico et al  analyzed 31 patients of CSS with renal abnormalities. Eleven patients had necrotising crescentic glomerlonephritis and nine of these 11 patients recovered to a creatinine of 1.3 mg/dL. Only one patient reached end-stage renal failure and no patient had a doubling of serum creatinine level after a mean follow-up of about five years. In comparison, with a mean follow-up of ten months (range 2-17 months), all patients of non-asthmatic CSS in our review have been relapse free. As com­pared with other ANCA-associated vascilitides, crescentic glomerulonephritis in CSS has good short- and long-term outcomes, and, from our review, it seems to be true even in patients with the limited form (non-asthmatic) of CSS. However, further evidence would be required to generalize this observation. From the limited experience of case reports, we conclude that pauci-immune necrotizing crescentic glomerulonephritis is the most fre­quent renal lesion in non-asthmatic CSS, and more than 90% patients show p-ANCA positi­vity. Renal recovery and prognosis of crescen­tic glomerulonephritis in patients of non-asth­matic CSS and classical CSS are comparable. 1. Sharma BK, Daga MK, Sharma M. A limited form of Churg-Strauss syndrome presenting without asthma and eosinophilia. Med J Aust 2004;181:498-9. 2. Chemmalakuzhy AJ, Zhou XJ, Hedayati SS. ANCA-negative glomerulonephritis associated with non asthmatic Churg-Strauss syndrome. Nat Clin Pract Nephrol 2008;4:568-74. 3. Prochnicka A, Zelichowski G, Wojtecka A, et al. Atypical clinical presentation of Churg-Strauss syndrome with rapidly progressive glomerulonephritis: Case report. Pol Arch Med Wewn 2009;119:830-3. 4. Yamashita Y, Yorioka N, Taniguchi Y, et al. Nonasthmatic case of Churg-Strauss syndrome with rapidly progressive glomerulonephritis. Intern Med 1998;37:561-3. 5. Malik TQ, Youmbissi TJ, Gacha R, Abdelrahman M, Al-Khursany Al, Karkar A. Atypical presentation of Churg-Strauss syn­drome: Another "forme fruste" of the disease?. Am J Med Sci 2002;324:276-8. 6. 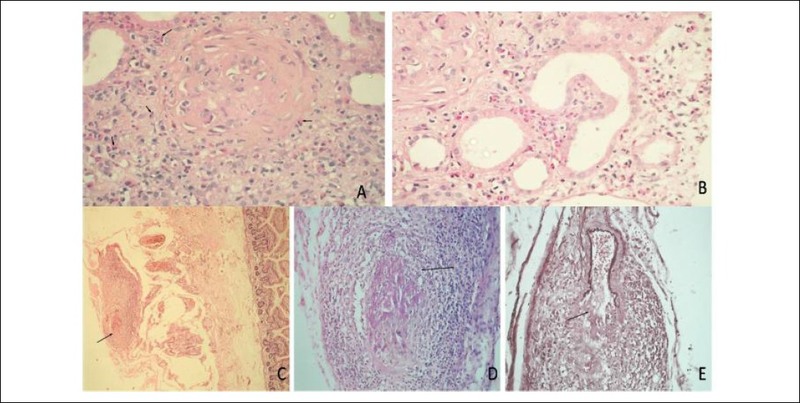 Yamamoto T, Yoshihara S, Suzuki H, Nagase M, Oka M, Hishida A. MPO-ANCA-positive crescentic necrotizing glomerulonephritis and tubulointerstitial nephritis with renal eosino­philic infiltration and peripheral blood eosinophilia. Am J Kidney Dis 1998;31:1032-7. 7. Horai Y, Miyamura T, Hirata A, et al. Churg-Strauss syndrome: A retrospective study of 11 cases from a single center in Japan. Int J Rheum Dis 2010;13:e6-10. 8. Sinico RA, Di Toma L, Maggiore U, et al. Renal involvement in Churg-Strauss syndrome. Am J Kidney Dis 2006;47:770-9.